Home » painters tape » wetnwild » Painters tape part 3! I had some funky ideas what to do next with the tape but I did this right before going to bed so I kept it simple. 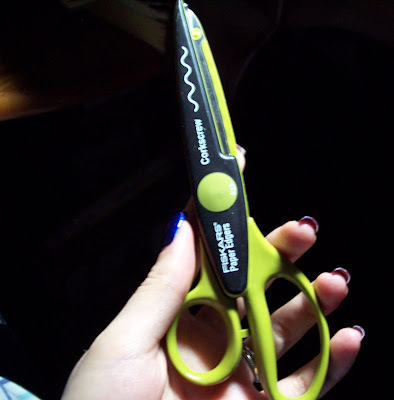 I used to be into stamping/scrapbooking so I had these craft scissors stashed away. I thought they would make an interesting line for me. I used two coats of Wet'n Wild Eggplant Frost, covered half my nail vertically with tape cut with the scissors and used one coat of NYC Skin Tight Denim. Next time I will use more contrasting colors because the dark blue and purple is hard to see together. Edit: Alex made this picture of Jasmine when she was puppy! I had a Welsh Corgi for 14 years! He was a sweet dog,but had a rather different personality! I've often looked at scrapbooking items wondering how they could aid us in our nail tricks and what you did is great! I'll have to check out that department some more when I'm in the craft store. Cool design! I just love the way Eggplant Frost look like! 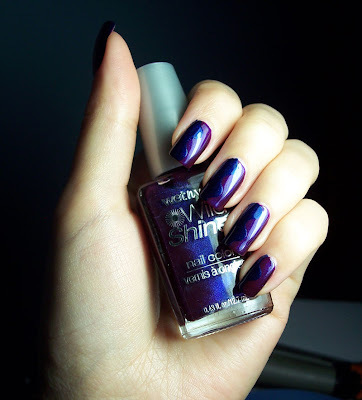 Alexyndra, thank you :D I've owned the purple polish for a couple of months and this is the first time I've worn it, was pleasantly surprised by the duochrome (it flashes blue to match!) so I'm liking it. Neat idea with the scissors. I have lots of different scissors. Scrapbook stuff also. Thanks Lucy, oooh you should try some with tape for cool designs!